One-Layer Simplicity Challenge: One-Layer Simplicity Challenge #2: Can You Repeat That? One-Layer Simplicity Challenge #2: Can You Repeat That? What a wonderful response we had to the new, improved, restyled, relocated One Layer challenge. What was once One Layer Wednesday now appears once a month on the 1st and runs until the 24th giving you way more time to get involved. Some people entered last month's challenge several times which just made for more wonderful inspiration. I hope you enjoyed our details post which highlighted some of the important little features of one-layer cards that make them special. 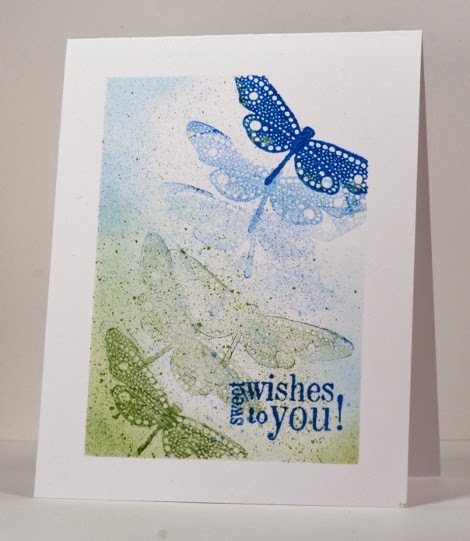 This month the challenge is to use repetition on your one layer card. You could choose an image and repeat it like I did with the dragonfly or perhaps repeat your sentiment. 2. Make a card which features something repeated. It could be an image or a sentiment. Just remember to keep embellishments to a minimum. 4. The most important rule of all...have fun! Let me repeat that...HAVE FUN!!! Oh, I'm first!!! Great challenge, Heather. I love focusing on such an important design concept...one that lends itself to CAS style so perfectly and is so versatile at the same time. Can't wait to see what everyone comes up with! omg.. thats super super fab , Heather:) So you have a tute on the background.. ?? Hi Jaya, thanks for the encouragement. I don't have a tutorial on the background but I will keep it in mind for the future. I sponged most of the background with Memento ink and flicked drops of watercolour paint directly from pencils onto the card with a waterbrush. Please enter as many as you'd like, Gerrina! We're glad that OLS is inspiring you! Beautiful scene with your blues and greens! I love this challenge! Repeated stamping, sounds as if we're going to have some fun here! Thank you Gay, we are all excited about the new format too and thrilled by the response.